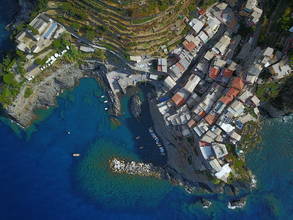 Cinque Terra is a an area consisting of five pristine villages on the northern Italian coast in the region of Liguria. The colorful seaside villages make for what is perhaps the most iconic spot in the whole country. Top contributor iDrone Aerial created this stunning aerial view of the area, which is characterized by the incredible visual interplay between the colors of the Adriatic Sea, the brilliant looking village rooftops, and the surrounding hills and mountains. Description: Visit Cinque Terre which is one of the most beautiful coastlines of Italy. Bus2alps runs day trips there in the summer season for affordable prices.